For the vast majority of people reading this, violence is easy to prevent without resorting to physical self defense. Additionally, non-physical means have a far lower level of risk and higher chance of success. 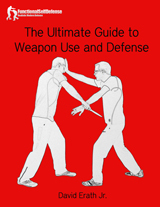 It may not seem that way, especially to those who have fallen victim to misleading martial arts and self defense marketing, but I hope the following chapter, which covers avoidance, awareness, and prevention, will make that clear. Most people do not need to learn martial arts in order to prevent being attacked. There are many misconceptions about physical violence, and the purpose of this chapter is to help shed light on the nature of serious violence and common problems in physical self defense and martial arts training. If you follow my advice on prevention, this material should be largely unnecessary. But if you don’t follow that advice, if you find yourself in an unavoidable physical conflict, or if you’re simply interested in being able to physically defend yourself even if the chance you’ll need to is low, the following material will be valuable. Real violence is fast, dynamic, and chaotic. At least one person in the encounter will be trying to injure another, and neither person will know what the other will do next. It’s not what you see in most movies or learn about in most martial arts classes. The images above are from a real assault, captured by a security camera I had installed outside an old house of mine. The woman was walking along the sidewalk when a truck stopped, a man got out, and ran at her. She froze in fear, and was tackled in a bear hug onto my concrete steps. As soon as she hit the steps the man was yelling and cursing at her, choking her, and slamming her head into the steps. He then dragged her into his truck and drove away. The bear hug wasn't at all like bear hugs trained in most martial arts or self defense classes. It lasted about one second, and was only used to slam the woman. The choke wasn't standing, and it wasn't on a flat surface where common defenses are trained. Not only was the woman on an uneven surface, but she was getting her head repeatedly slammed into the steps and screamed at while being choked. This is a real assault. In any attack where you can legally defend yourself, your opponent(s) will probably have a significant advantage over you, or at the very least a perceived advantage. There will be more than one, they'll have weapons, and/or they'll be bigger, stronger, and faster than you. If they don't think they have an advantage, they'll choose another victim. Real violence is ugly, and it is best avoided or prevented. The vast majority of martial arts today do not prepare practitioners for real assaults. They don't address avoidance, awareness, and prevention, don't have effective strategies for dealing with an assault or training methods that work, the techniques are for art or sport rather than for doing maximum damage, and they fail to address weapon use and defense and multiple opponents. All training takes place in well lit rooms, on clean, flat surfaces with nothing to trip over or run into, and in clothing that's easiest for moving around in. Mock attacks are generally done with "proper form". They're single attacks or easy to identify techniques one after another, and the "bad guy" doesn't fight back after his initial attack is blocked. Real attacks occur in real places, not empty training rooms. Outdoors there are curbs to trip over, cars and steps to fall on, walls and corners to get rammed into, and good places for an attacker to hide in order to rush out and surprise you. Indoors there is limited space to move around, with plenty furniture to fall over or get knocked or slammed into. There are objects all over that can be used to beat or stab you. Your attacker(s) will likely have a weapon anyway. It's likely to be dark, and you won't be able to see well. You may not even know if your attacker has a weapon or not, even after you've been stabbed, slashed, or beaten with it. Real assaults generally involve a great deal of movement and chaos. They are nothing like what most martial artists train for. The woman attacked in the video above was killed in the assault, stomped to death by her attacker because she continued to make noise. This is a real assault. Martial sports (boxing, Thai boxing, and Brazilian jiu jitsu for example) do a good job of preparing students to deal with an entirely uncooperative opponent. However, they focus on one-on-one “fights”, with limited techniques and ranges, between two willing participants, without weapons, and in clean spaces designed for fighting. Many traditional martial arts claim to focus more on self defense, but fail to train against uncooperative opponents who are fighting back. In reality, although they may use more potentially dangerous techniques in training, students of these styles are even less prepared to deal with a real attack than those who train in martial sports, due to their lack of familiarity in noncooperative environments. 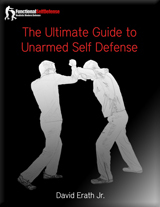 The coming chapter on training will cover this in detail, along with all of the concepts and drills necessary to create physical self defense ability. Accurately writing about violence is a challenge. One one hand, it’s important to explain the nature of violence and the problems with most martial arts and self defense training. On the other hand, scary and tough talk can be damaging and counterproductive. Violence is negative and destructive, and becoming paranoid or obsessing about crime will decrease your quality of life. You can avoid or prevent an attack or physically defend yourself without becoming obsessed with violence, wearing camouflage pants, and carrying three knives to the bathroom. It’s easy for people to take self defense too far, to let it change their lives for the worse. Negative thoughts, words, and actions produce negative feelings and make the world a worse place for us all. Positive thoughts, words, and actions do the opposite. They make the world a better place for us all. Although violence is ugly, it’s unnecessary to act tough or imagine you’re a pseudo-special forces operative in order to defend yourself. In fact, such behavior will likely make you a more attractive target for people looking to start trouble. There are two very different approaches you can take to self defense. You can act with the intention of defending yourself, or you can act with the intention of hurting another person. Both approaches can work for self defense. But the first will make you a happier, more likeable person. The second will make you a negative, fearful, and paranoid person. Acting tough is for losers.